Most of the relics of the Tien Ti Hui were destroyed by the Qing (Ch'ing) Government after the insurrections was suppressed. They continued to suffer from damage or fall into oblivion after repeated turmoils of China's society. And as a result, very few of the Tien Ti Hui coins had survived till this day. This coin may be an exception. Until now, I can not decide whether this cash coin is genuine, I have my suspicions. No. 034 This "P'ing Tsing Sheng Pao" coin is large as the five cash. The colour of this cash is very strange to me, I find that those 'P'ing Tsing cash that I have seen before were made of brass, but this cash was made of copper. I hardly to identify it. "P'ing Tsing" coins were occasionally unearthed in the provinces of Kwangtung, Kwangsi, Hunan and Hupeh. 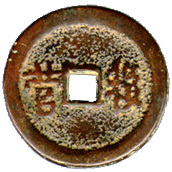 They were commonly known as the "Taiping Tien Kuo" coins before. But, their colour and inscriptions are different from the "Taiping" coins. 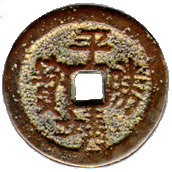 Inscriptions bearing on the obverse of this coin are Chinese characters "Ping Tsing Sheng Pao" , reading from top to bottom and right to left, with the meaning of "The victorious currency of conquering the Ch'ing government". [The characters "Tsing" and "Qing or Ch'ing " are homonyms in Chinese. Their meanings could be borrowed between each other in Chinese literature.] Inscriptions on the reverse are Chinese characters "Hou Ying" [rear corps]. Other inscriptions bearing on the reverse of "P'ing Tsing" coins included several kinds, such as "Chien Ying" [front corps], "Tso Ying" [left corps], "Yu Ying" [right corps], "Chung Ying" [central corps], and "Yu Lin Chun" [army for the imperial use only], etc. In april, 1854, leader of "Sam Ho Hui" [Triads], Chen Kai led a revolt of peasants in Fo Shan of Kwangtung province. When Chen started out on their western expedition from Kwangtung to Kwangsi province, another armed force organized by Li Wen Mou , a former acter of Kwangtung opera, in San Yuan Li of Canton, advanced to join them together. They attacked "Wu Ch'ou" and took the city. In August, 1855, Chen Kai announced the establishment of the "Ta Cheng Kuo" and proclaimed himself as "Chen Nan Wang" in Sin Ch'ou of Kwangsi province. The Chen's imperial title is "Hung Te" . Chen had cast coins too, but I don't know what kind copper cash he had cast. Some source suggested that Chen Kai minted "Hung Te T'ung Pao", but actually "Hung Te" coins were Vietnamese coins. At the end of 1856, No.2 of "Ta Cheng Kuo", Li Wen Mou proclaimed himself as "P'ing Tsing Wang" and captured Liu Ch'ou . Li cast "P'ing Tsing Sheng Pao" coins and organized opera to celebrate his victory. In May 1858, Li Wen Mou was killed during the breaking of Liu Ch'ou city under the Ching troops onslaught. I think it was why "P'ing Tsing" coins were found few in number. In 1853, as the great success of the "Taiping Tien Kuo" revolution, the Hsien Feng Emperor found that the "Taiping" rebel had directly influenced the whole country, he orderd to raise the militia force along the Yangtze River districts. Tseng Kuo Fan , a vice-president of the Board of Rite,who detested the Taiping, was ordered to organised the Hunan army. Tseng's army generals were natives of Hunan province. All the solders were recruited by each of the regimental commanders themselves in order to ensure obedience. All the solders were answerable only to his commander and Tseng Kuo Fan. In March 1854, Tseng's troops became the biggest militia force in China, including 17000 solders. In April 1854, Tseng's troops attacked Yao Ch'ou from Changsha. He was defeated in his attempt to captured the city and even worse, he lost one more city Tsing Chiang . On April 28, as Tseng laid siege to Tsing Chiang, his navy met the Taiping strong bombardment and the tow ropes of his boats were cut by the special squad of Taiping troops. At the same time, Tseng's army was also lost on land. He erected a banner which read: Those who go past this banner will be executed". But, it did not help, his solders went on to flee and passed the banner with a detour. Tseng felt shame at failing in the battle. He jumped into the water and saved by his attendents. As Taiping force was too weak in Hunan, Tseng got a chance to rebuilt his troops and captured Yao Ch'ou at the same year. "Taiping Tien Kuo" cast the "P'ing Tsing Sheng Pao" coins for commemoration to mark the victory in Tsing Chiang. In the beginning of the eighteenth century, the economic condition of China was not so good. While the land and wealth gradually concentrated to minority of people, majority of Chinese became ever more impoverished. After the Opium War of 1839 to 1842, the condition was even worse with the Treaty of Nanking. The whole country's trade and industry were more or less affected by the western impact. The additional foreign influences intensified the inherent contradiction in Chinese society. Those poor people had nothing and were not able to get the necessaries of life. The only increase was the opium smokers. Furthermore, there was famine in large area of Kwangsi and Hunan provinces for several successive years. The poor people were deserving or needing help and sympathy, but they had been abandoned by the government. They organised the secret societies to help themselves. During the early 1840s, there were so many uprisings of the lower level members, such as the urban or rural labourers, peasants and handicraft workers in Kwangtung, Hunan and neighbouring provinces. Most of these rebels were initiated and organized by the popular secret societies such as the Pai Lien Chiao ("White Lotus") and Tien Li Chiao (Heaven and Earth Society) which had spread throughout the southern provinces of China. The Tien Ti Hui , also known as the San Ho Hui (Triads), was a secret society of a popular, anti-dynastic nature, whose members included handicraft workers, peasants, urban and rural labourers and vagrants. The Tien Ti Hui had existed for a long time, as a representation of popular dissent to the Qing government. About the beginning of the Tien Ti Hui, Chinese scholars have not come to an identical view. Some sources suggested that the Tien Ti Hui was begun in the thirteenth year of the Kang Hsi reign (1674AD), and the other sources said that the Tien Ti Hui was organised in the twenty-sixth year of the Chien Long reign (1761AD) of the Qing dynasty. According to the information printed on the book "Luo Ergang and the Taiping Tien Kuo History", an official report from the Kwangsi governor Cheng Lin to the Chia Ch'ing Emperor in the sixteenth year of the Chia Ch'ing reign (1811AD). The report mentioned about the arrest of Li Tien Pao , leader of the Tien Ti Hui in Kwangsi province. This showing the Tien Ti Hui activities at less could be traced back to the beginning of nineteenth century. The Taiping Revolution, Foreign languages press, Peking, 1976. Luo Ergang and the Taiping Tien Kuo History, Szuchuan Provincial Social and Scientific College Press 1987. 張作耀 ：中國歷史便覽，人民出版社，1992，(Zhong Guo Lishi Bianlan) ISBN 7-01-000308-4/k.53.